Beaphar Fresh Breath Tablets are scientifically formulated breath freshening tablets that have been designed to combat chronic bad breath problems. Providing a long term solution, the Beaphar Fresh Breath Tablets contain chlorophyll, which is a natural substance derived from green plants that absorbs nasty odours. 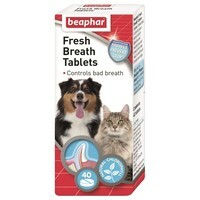 Using these tablets in conjunction with regular brushing of your dog’s teeth can work to defeat that bad breath problem!